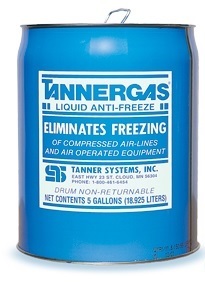 Tanner Gas TG-5 In-Line Anti-Freeze In 5-Gallon Pail Comes In Liquid Form, And Is Introduced Into Air Lines By Atomization. TANNERGAS Bonds To Moisture In The Air Line Preventing Freeze-Up And Therefore, Preventing Costly Downtime. TANNERGAS Is Available In 54- 30- And 5-Gallon Containers And In A Convenient One-Quart Container Marketed As TANNERGAS/FREEZE-BAN. TANNER DE-ICANTS Are Available In Three Advanced Tanner Formulas: TANNERGAS®/FREEZE-BAN, NO-TOX2® And FROSTO®. Each Formula Has Its Own Icon Selection. When Tanner De-Icants Are Injected Directly Through Our Dispensers Into Your Compressed-Air Equipment They Bond With The Moisture And Prevent It From Freezing. Additionally, Tanner De-Icants Have Special Additives That Prevent Corrosion And Inhibit Rust, And A Special Lubricant That Helps Prevent O-Rings And Other Rubber Or Synthetic Parts From Drying. These Items Are Considered Hazardous Material And Must Be Used In Accordance With The MSDS Requirements Linked Below. Shipment Must Be In Approved Containers And Are Subject To Hazardous Material Rules, Regulations And Pricing. TANNERGAS Can NOT Be Shipped UPS Overnight Or Federal Express. If Overnight Service Is Needed Please See The NO-TOX2 At Bottom Of Page. 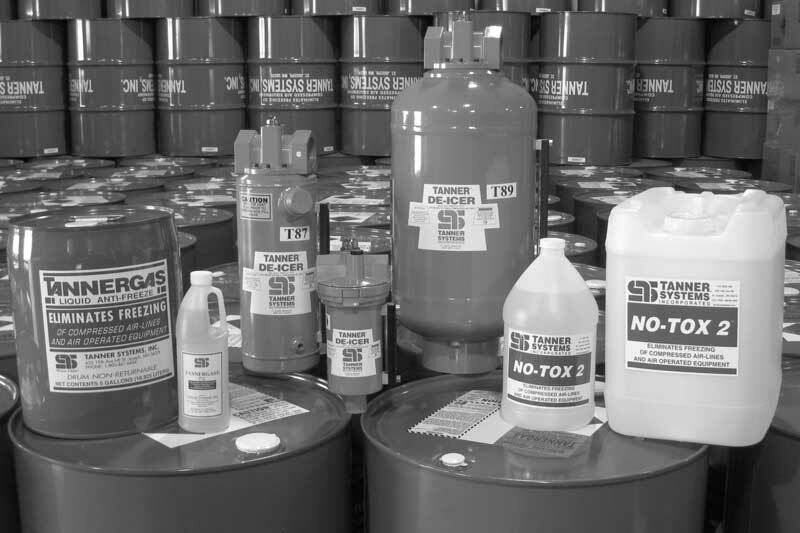 HAZARDOUS MATERIAL CHARGES ARE ADDITIONAL ON ALL SHIPMENTS AND WILL BE CHARGED SEPARATELY. APPROXIMATELY $35.00 ON FREEZEBAN & 5 GALLON TANNERGAS. UPS SHIPMENTS FOR 5 GALLON PAILS WILL HAVE AN ADDITIONAL $7.50 ADDED FOR CARTON PACKAGING PER EACH PAIL. THESE CHARGES WILL NOT SHOW UP ON ONLINE CHECK-OUT AND WILL BE ADDED TO FINAL PRICE SHOWN. TANNERGAS Is Effective In Both Above-Ground And Open Air Applications. If You Are Working In Confined Areas Or Underground Atmosphers Such As Mines And Tunnels Use NO-TOX2. This Equipment's Posted Price Is Based On A Credit Card, Wire Transfer Payment Or Prepaid Check, Includes A Freight Allowance & Customer Offloading At A Business Location.